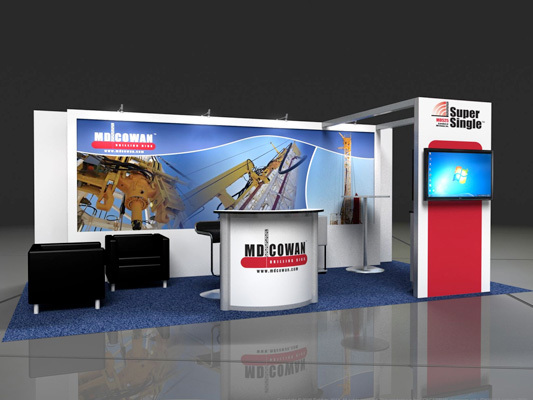 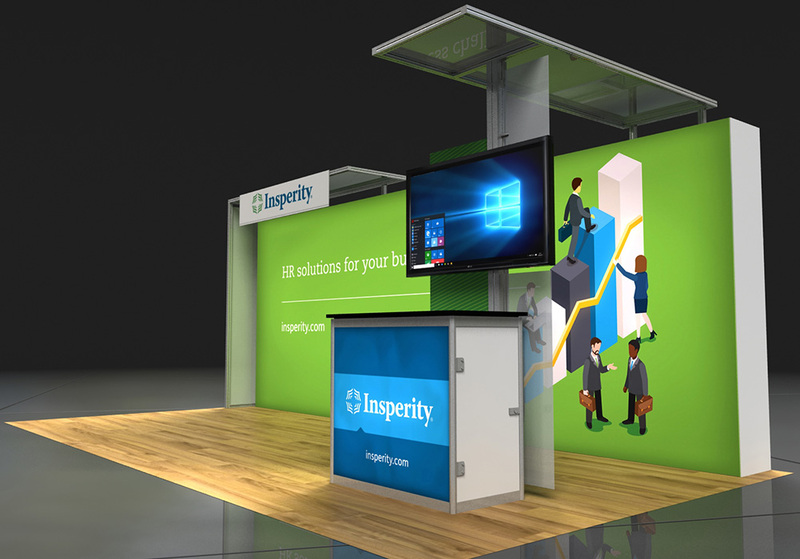 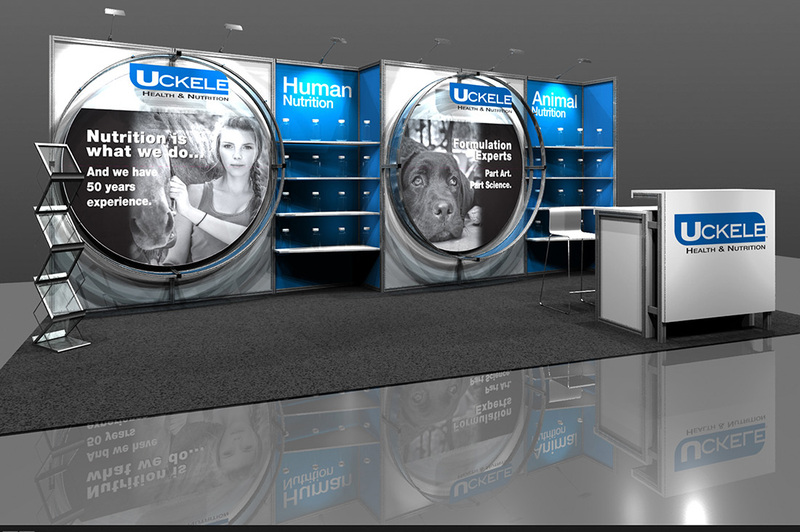 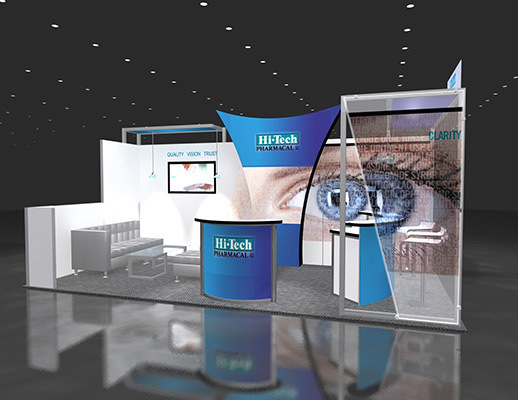 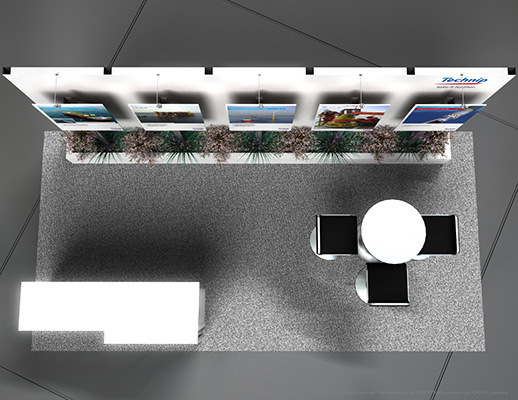 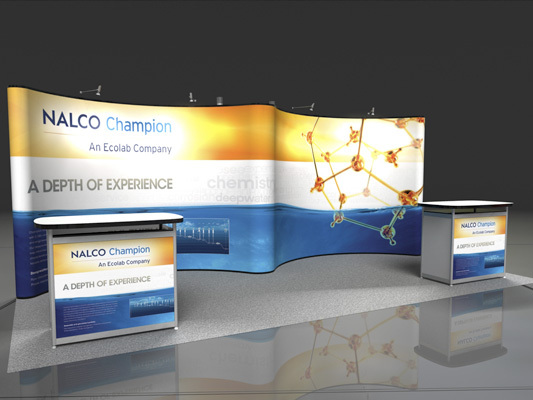 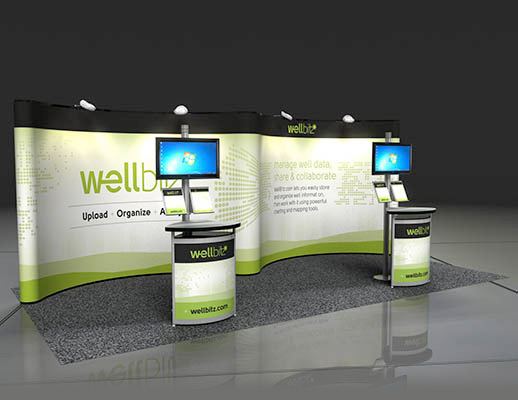 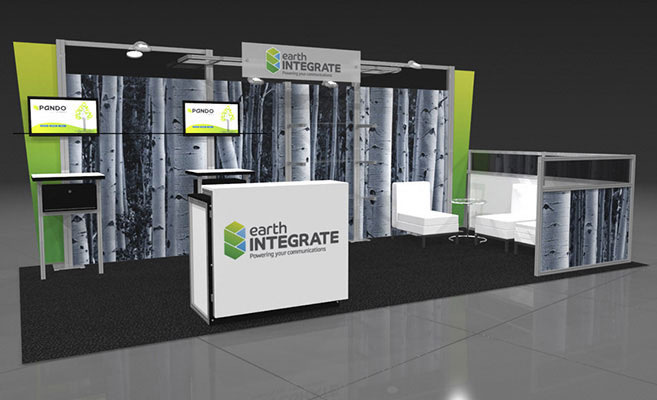 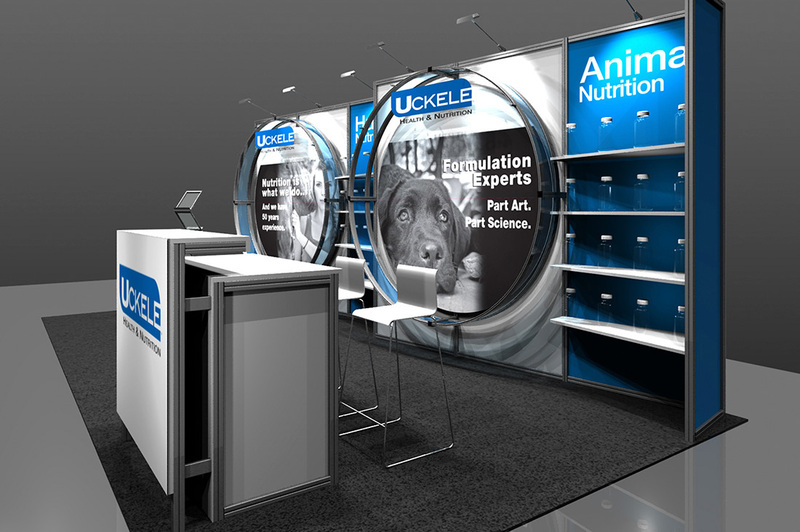 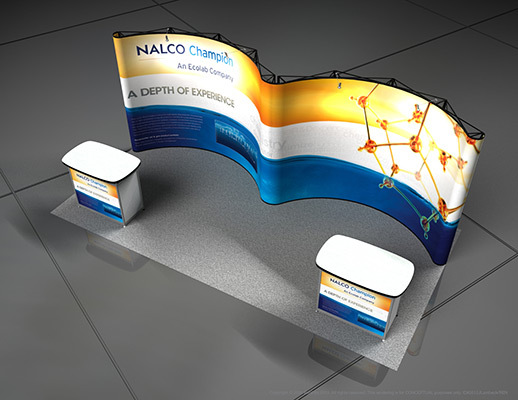 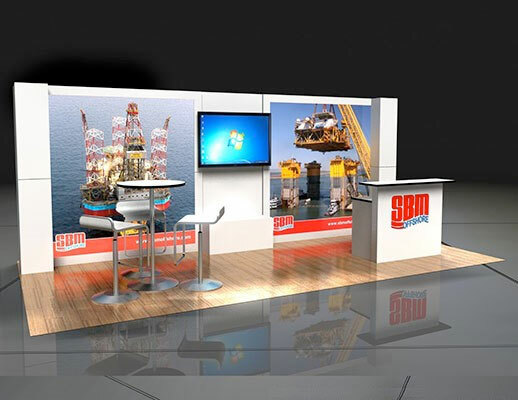 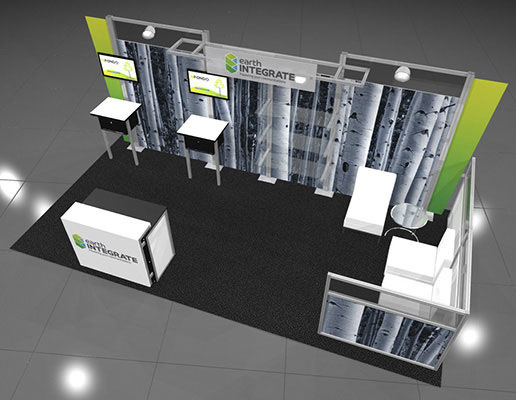 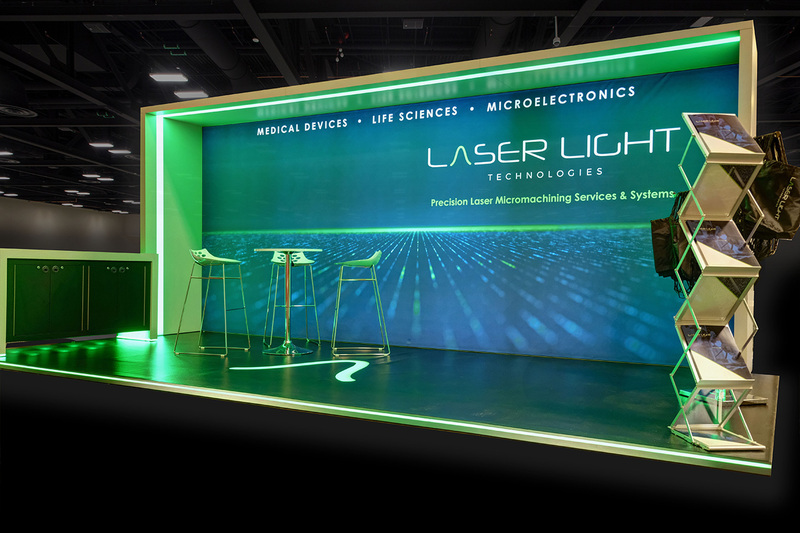 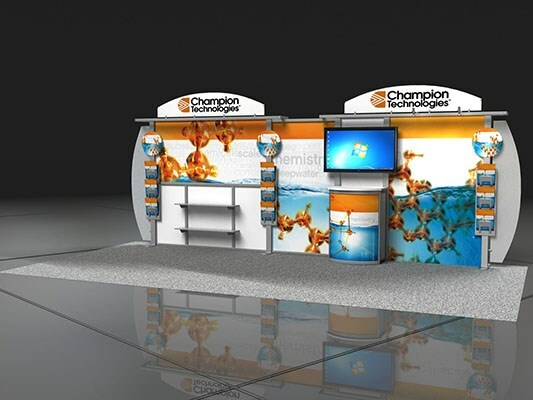 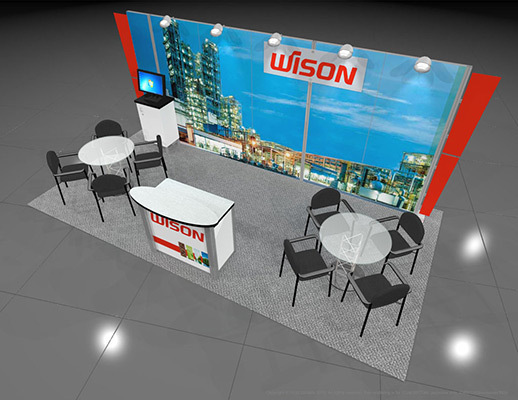 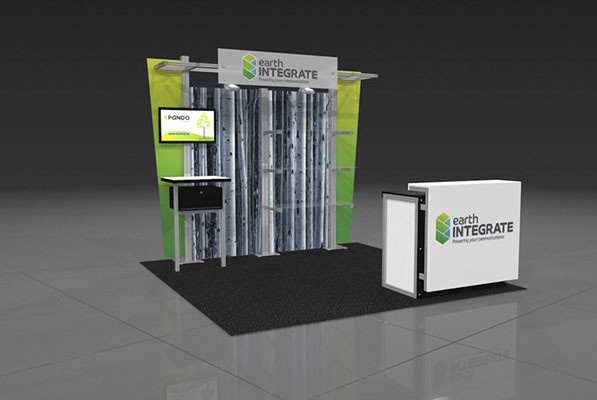 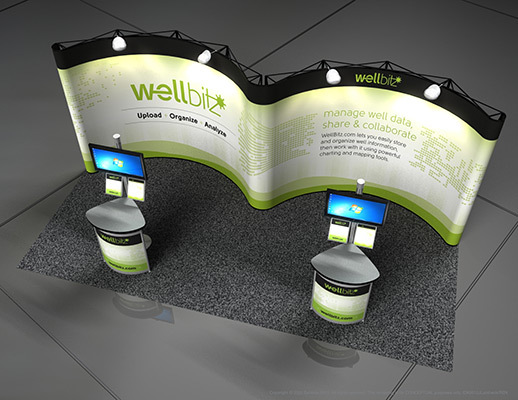 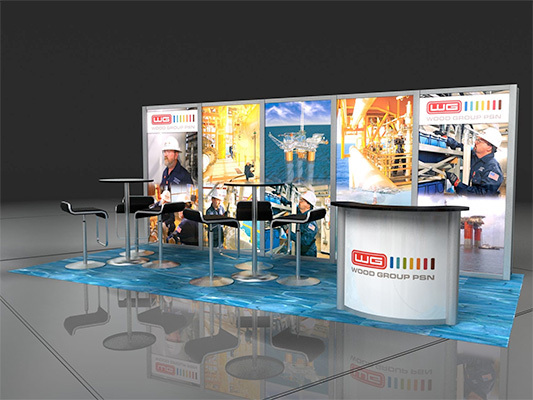 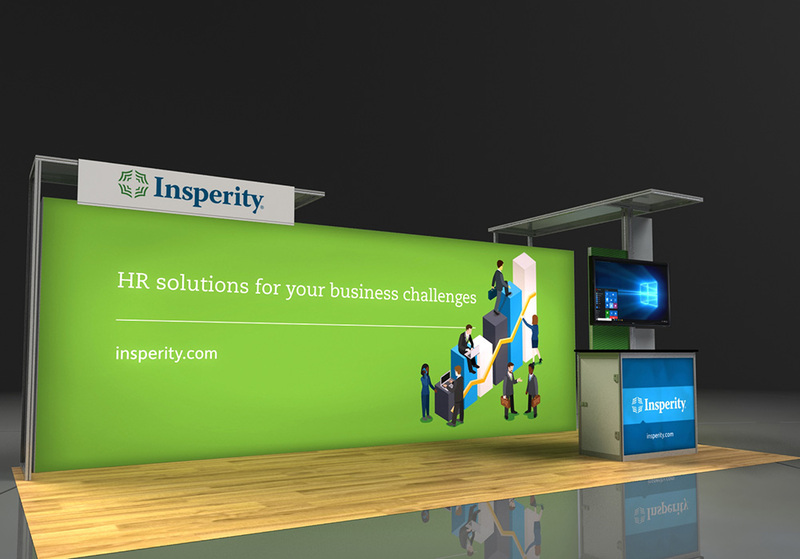 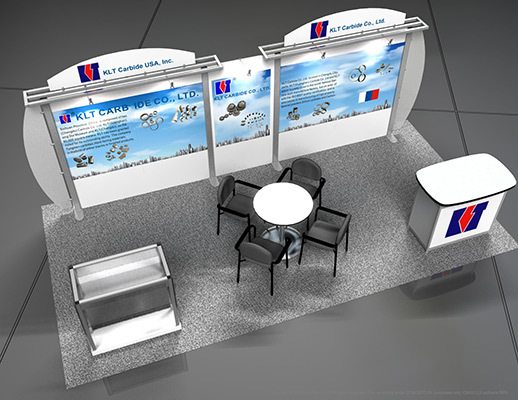 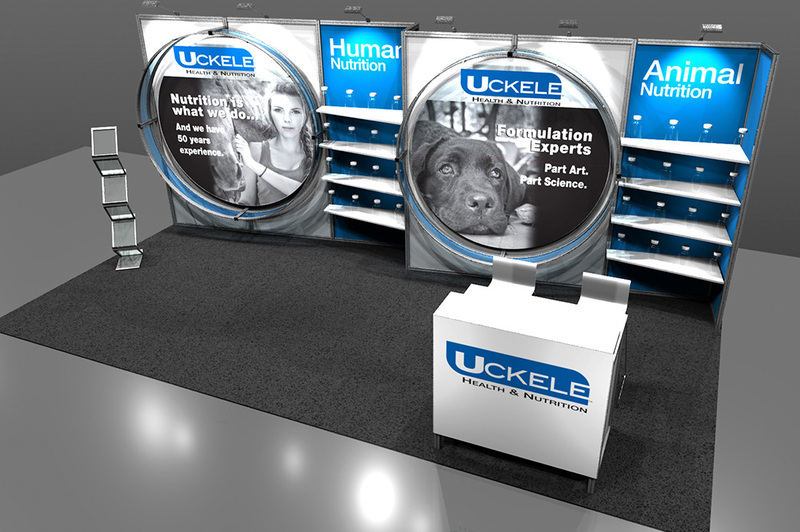 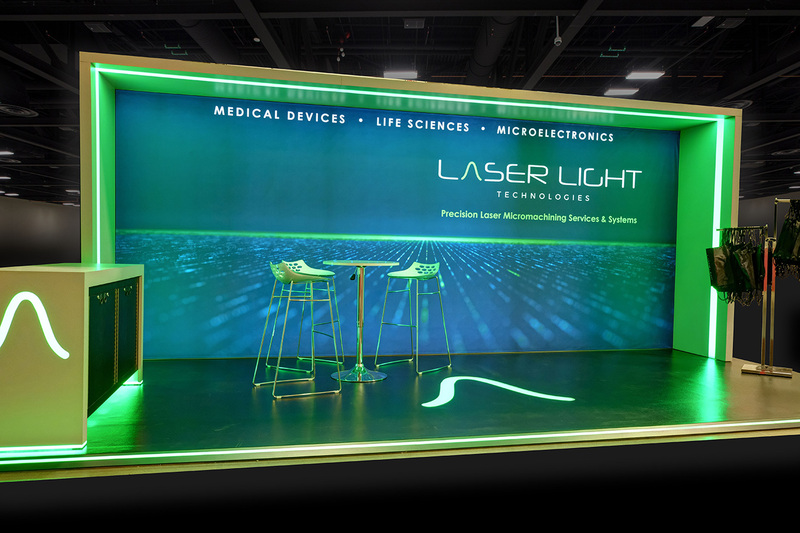 Featuring side-by-side double curved graphic backdrops, this exhibit provides ample walking room and space for meetings/discussions. 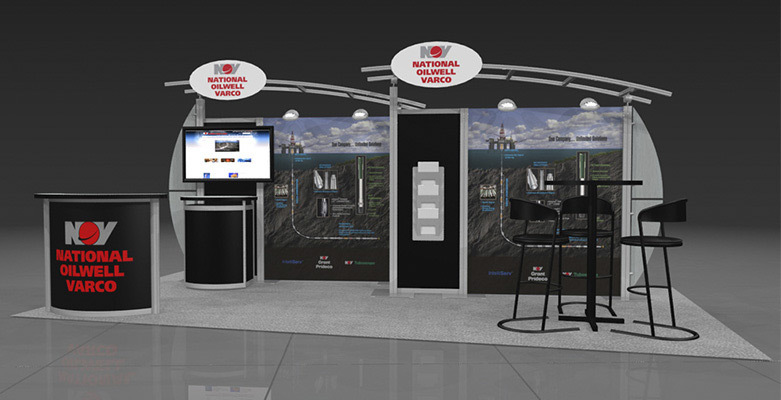 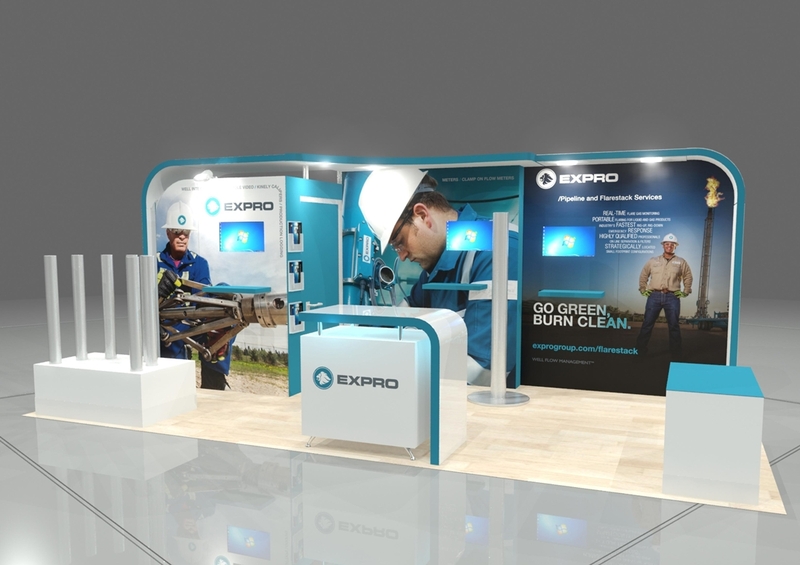 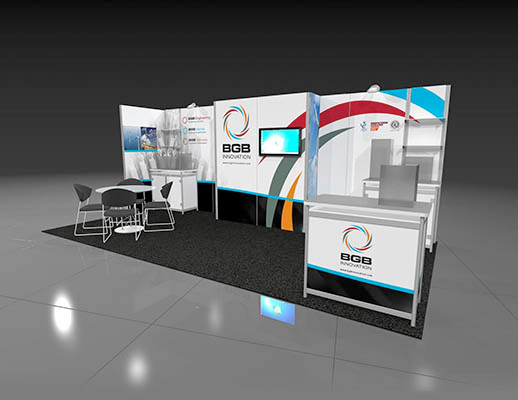 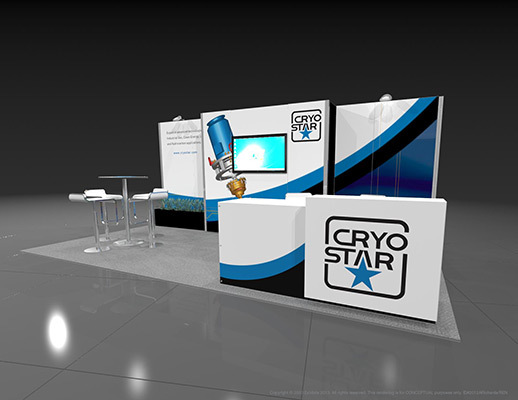 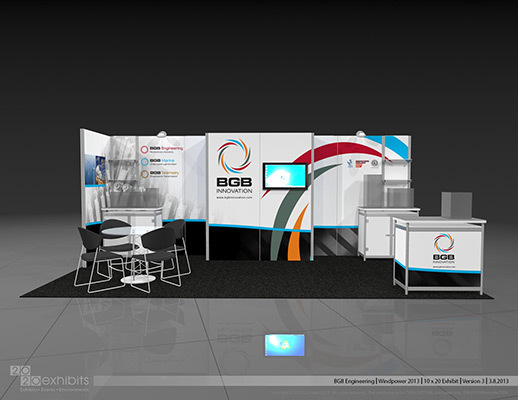 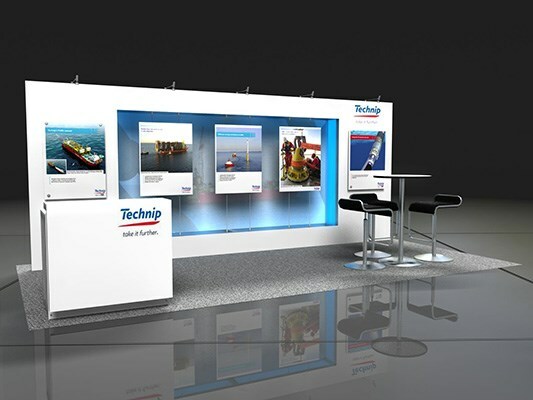 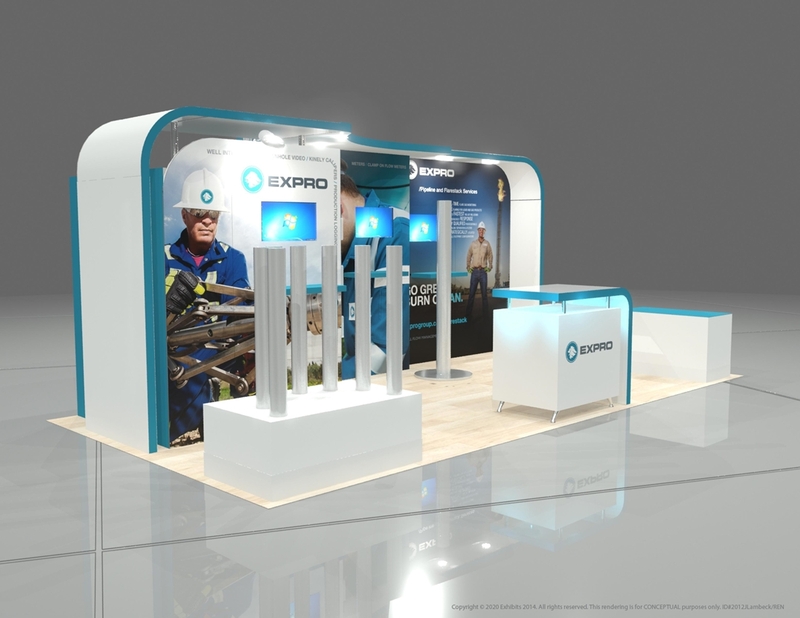 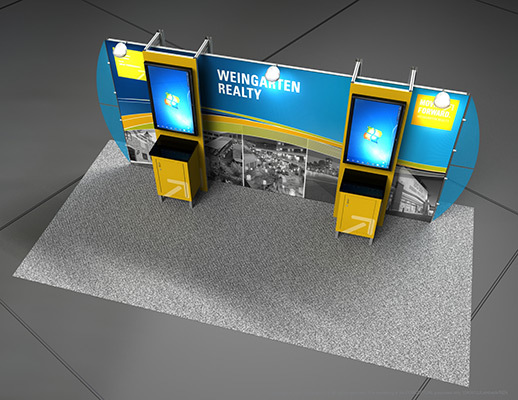 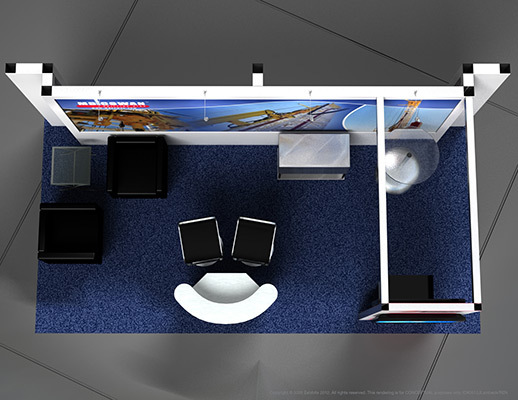 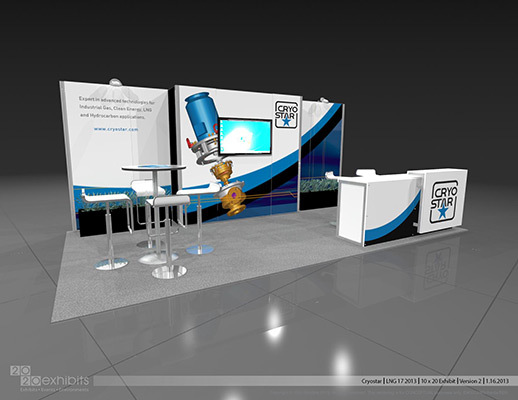 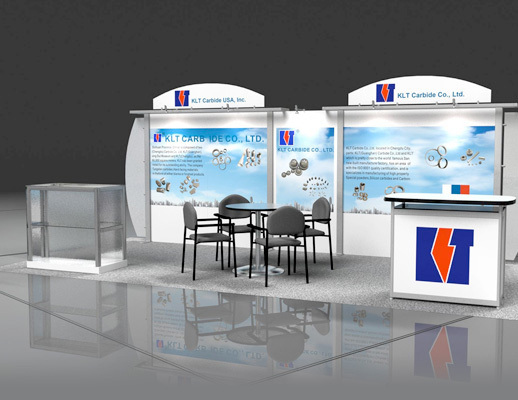 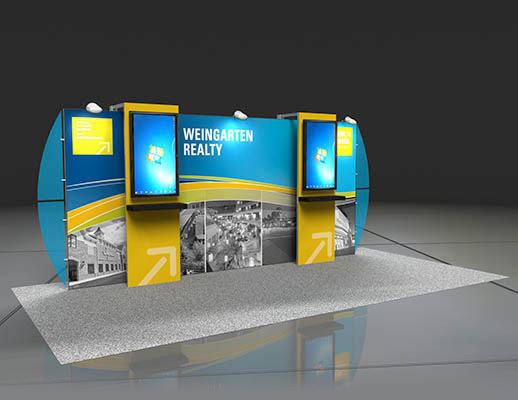 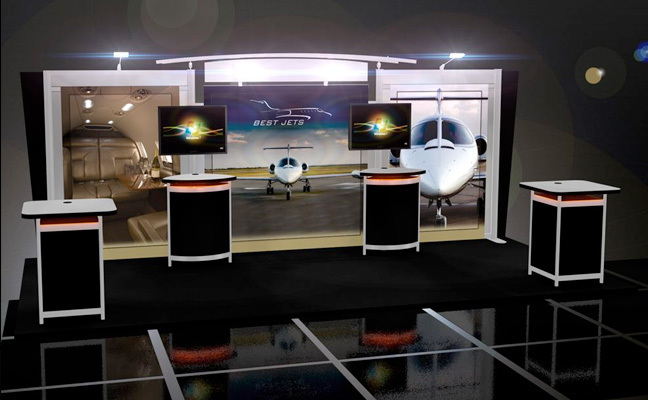 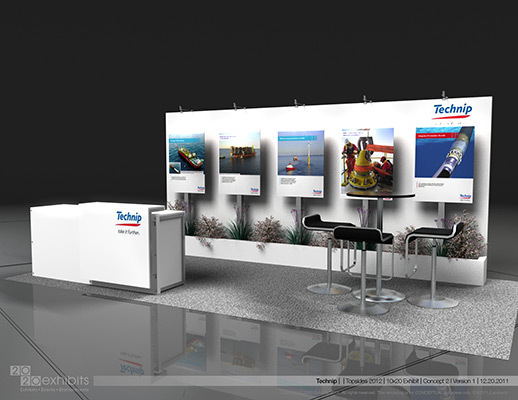 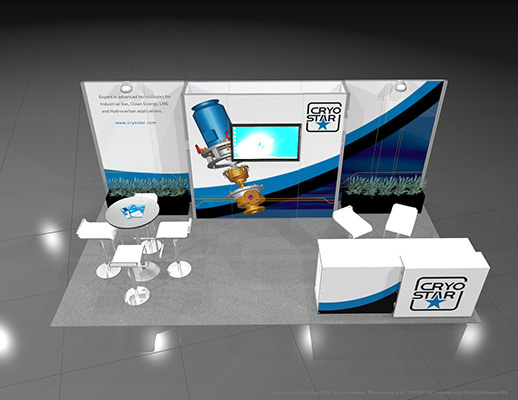 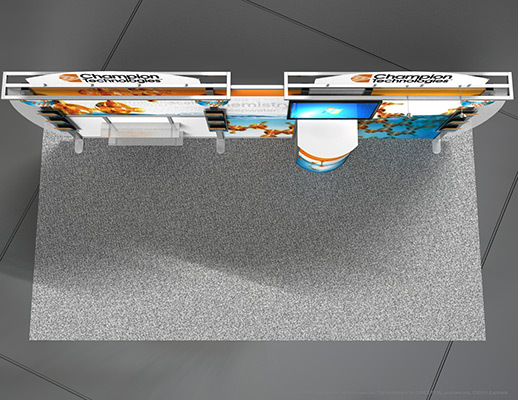 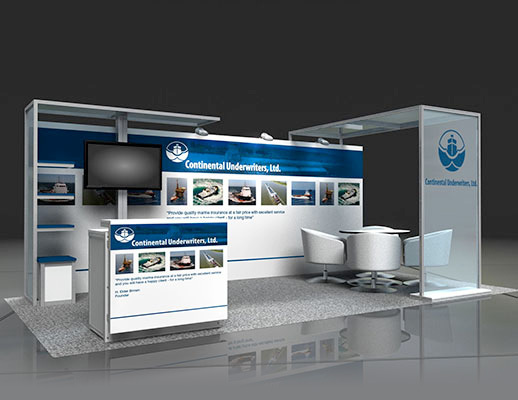 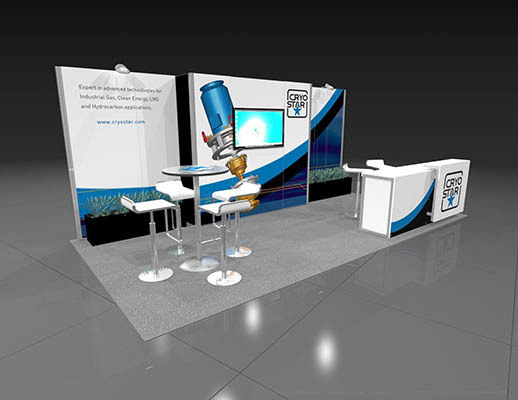 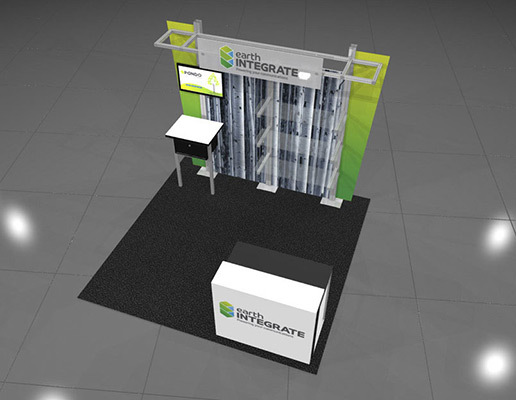 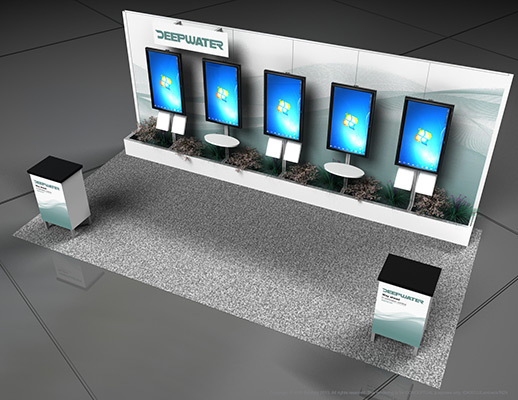 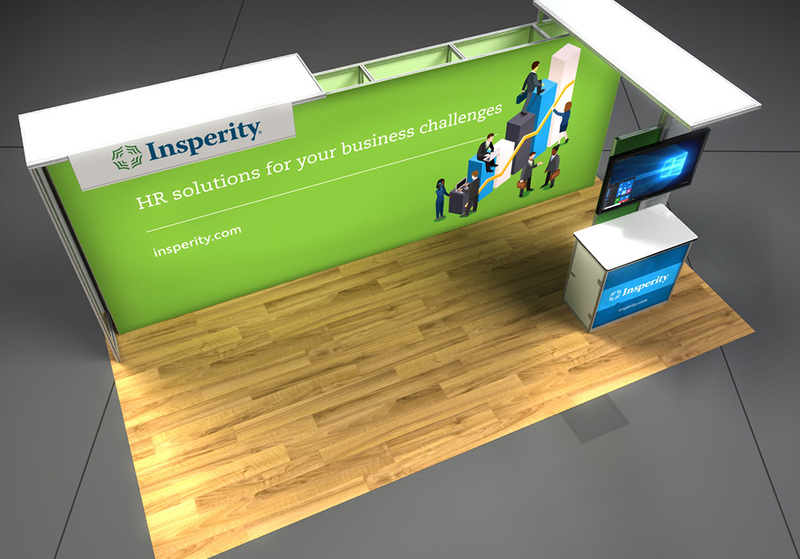 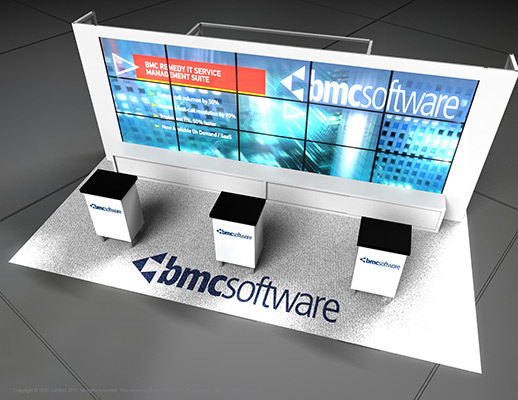 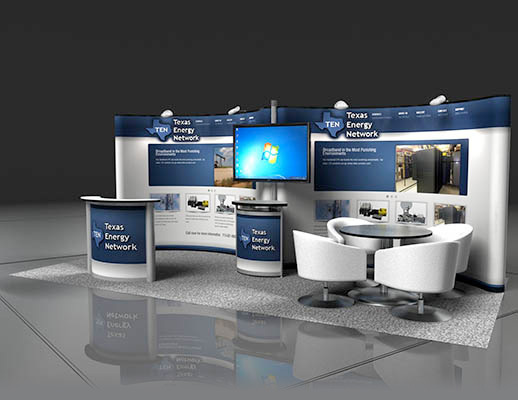 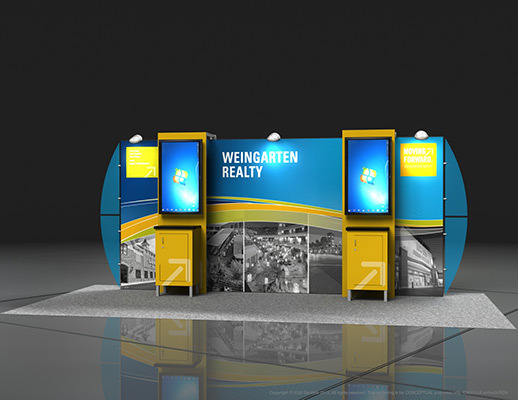 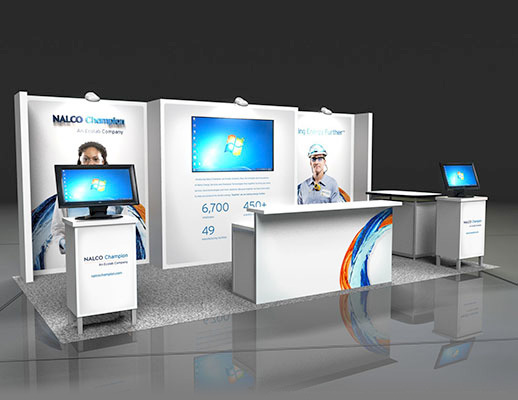 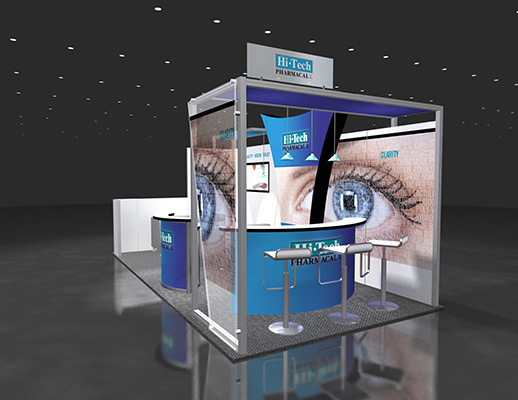 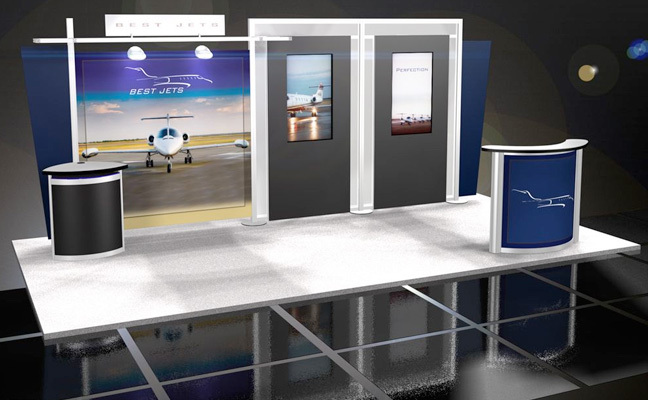 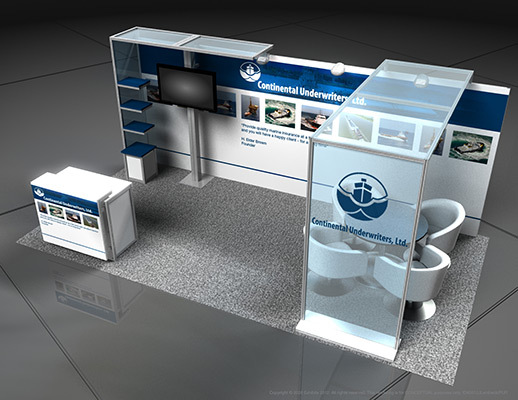 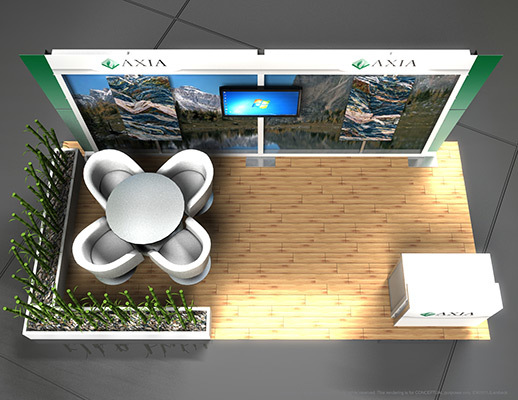 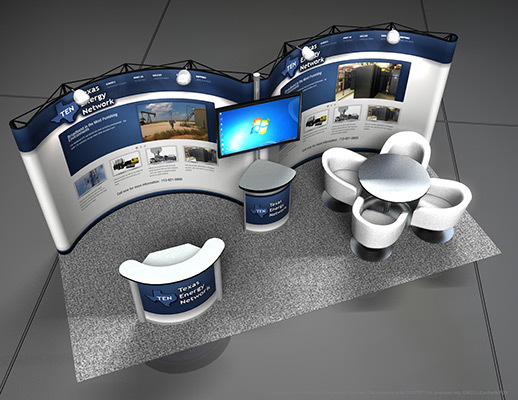 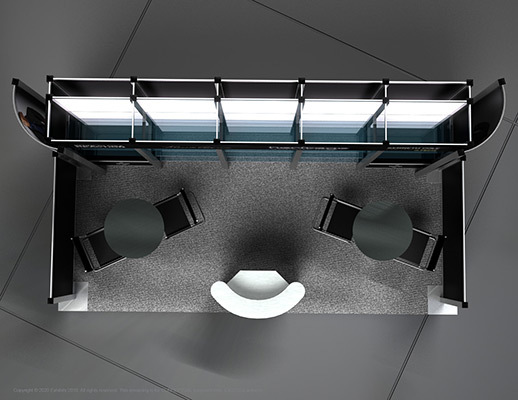 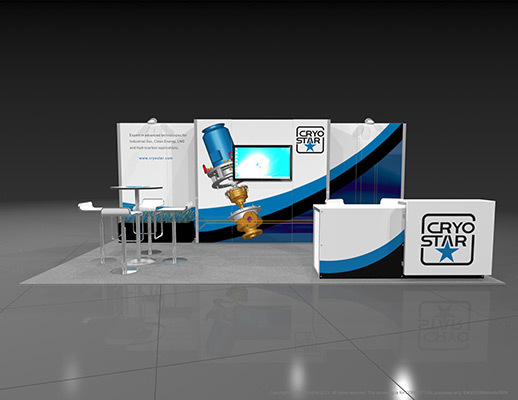 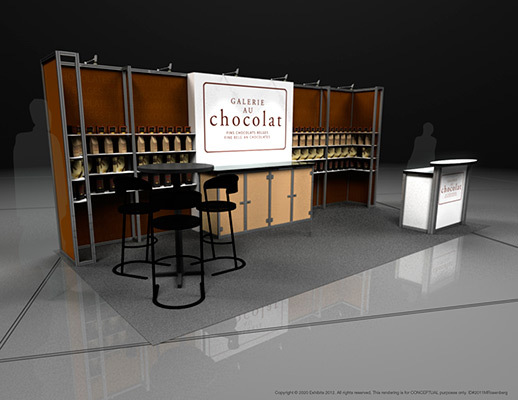 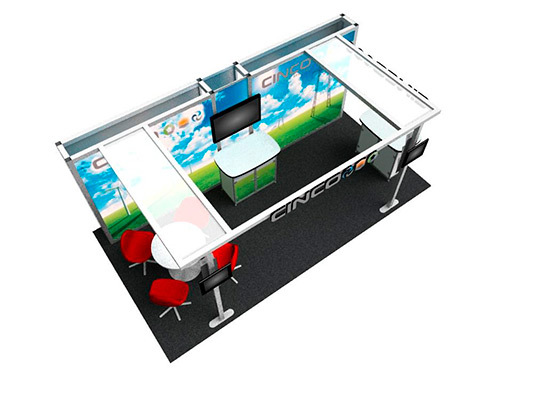 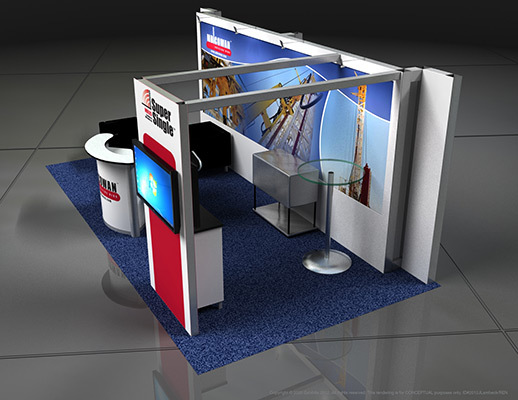 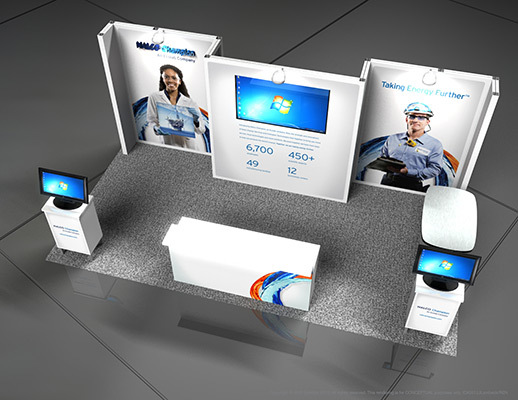 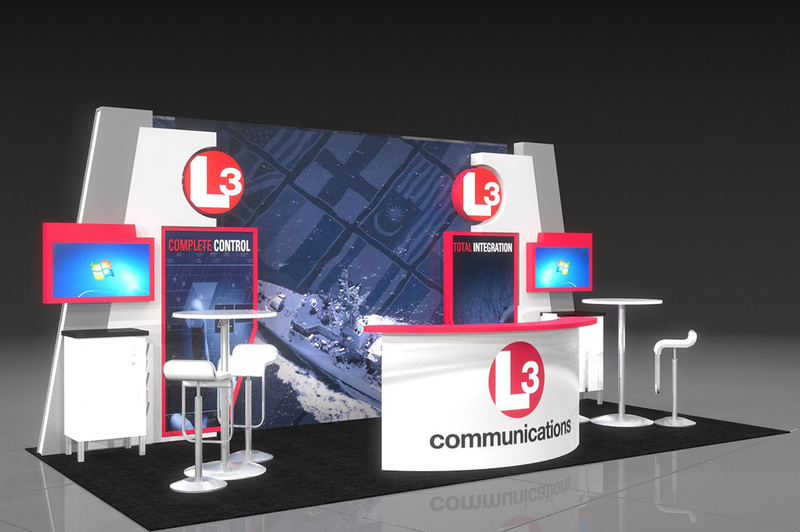 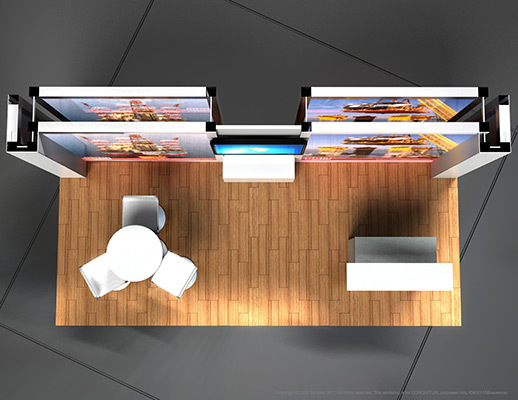 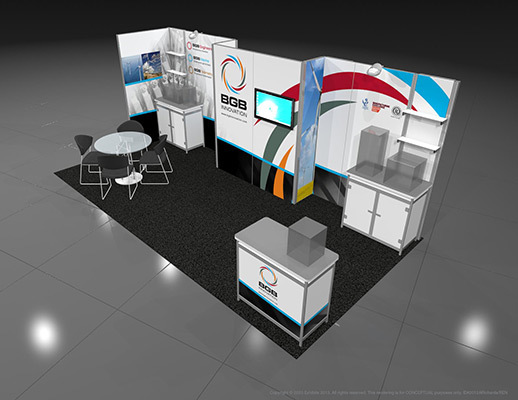 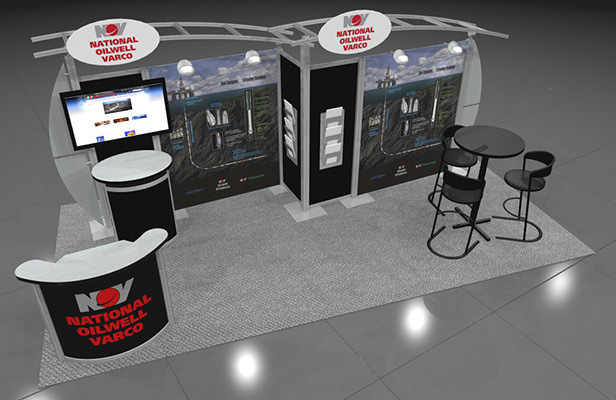 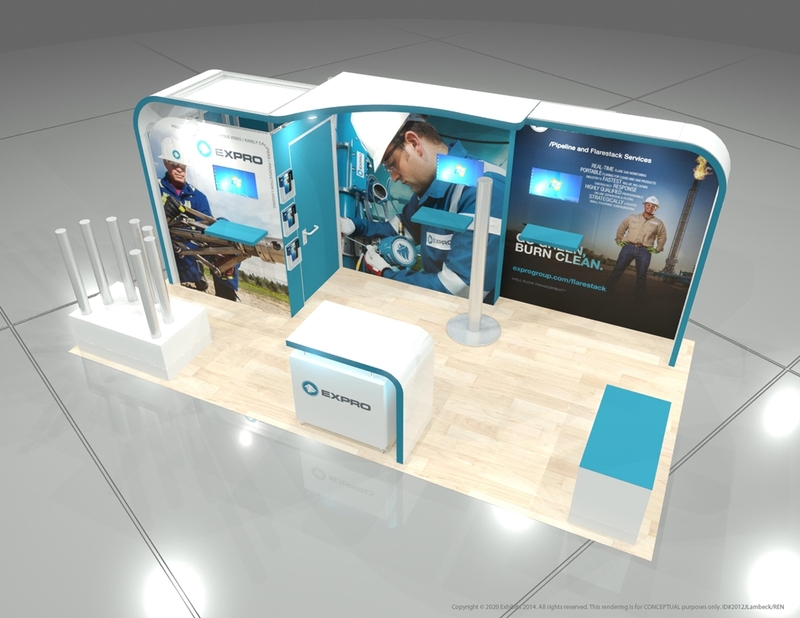 The strong graphics provide a theme for the booth and also compel visitors to investigate further. 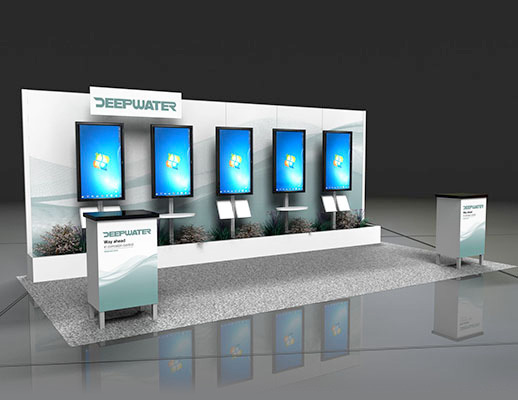 Multiple video monitor stations provide the ability to cater to several different attendees at once. 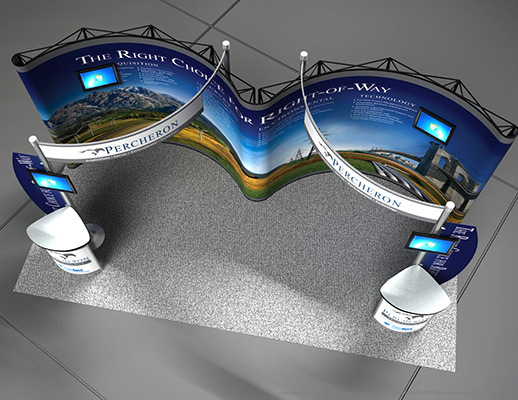 The curved graphic signage intersecting with the backdrops lends a visually appealing aesthetic to the exhibit that attracts attention. 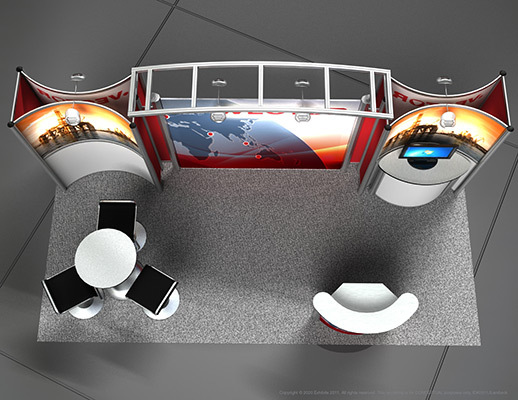 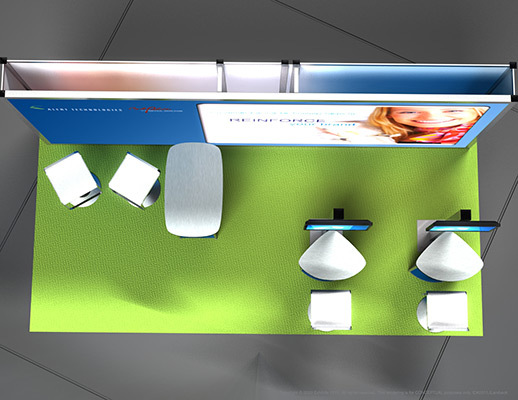 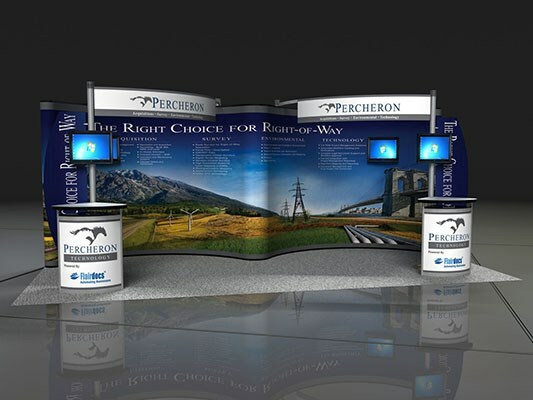 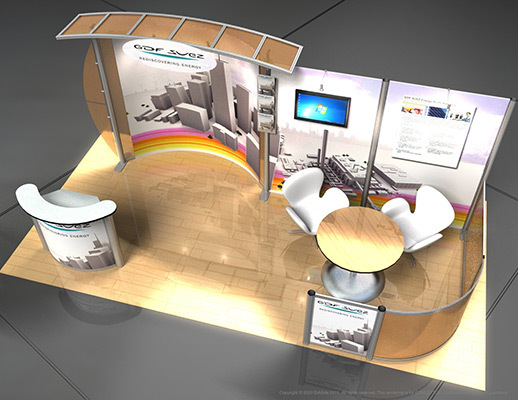 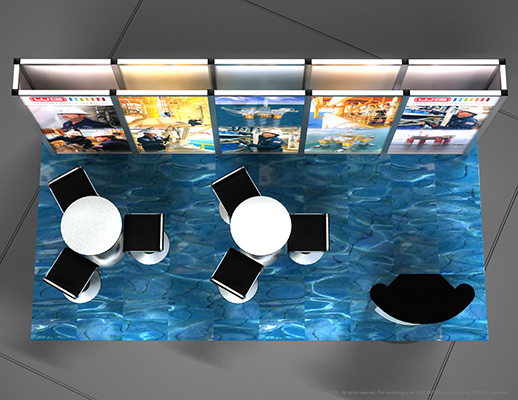 Dual reception desks and literature displays allow for representatives to engage several different groups of visitors simultaneously. 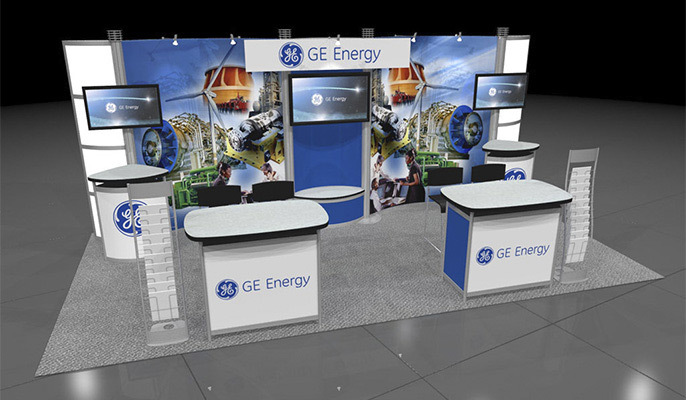 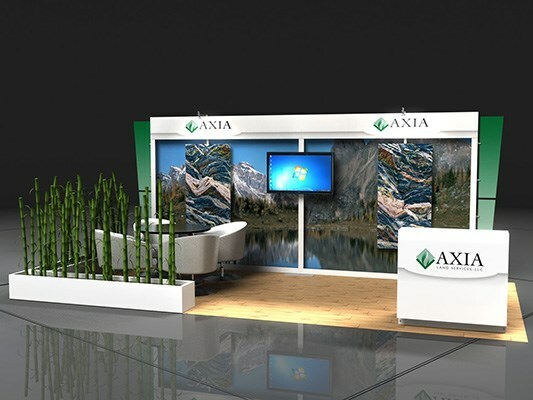 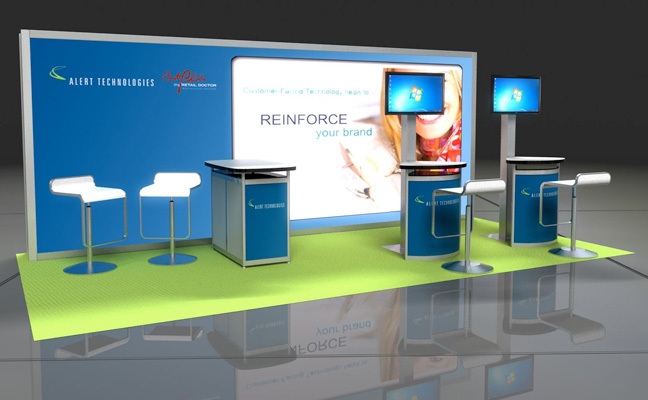 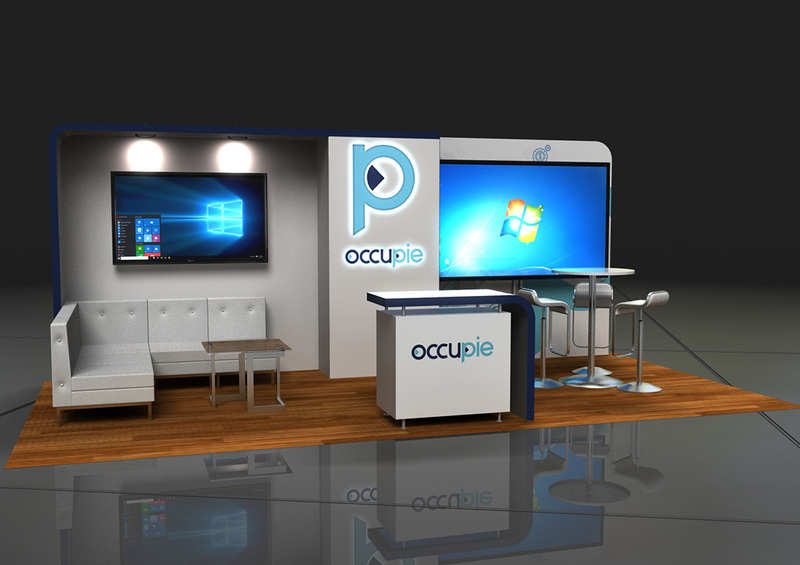 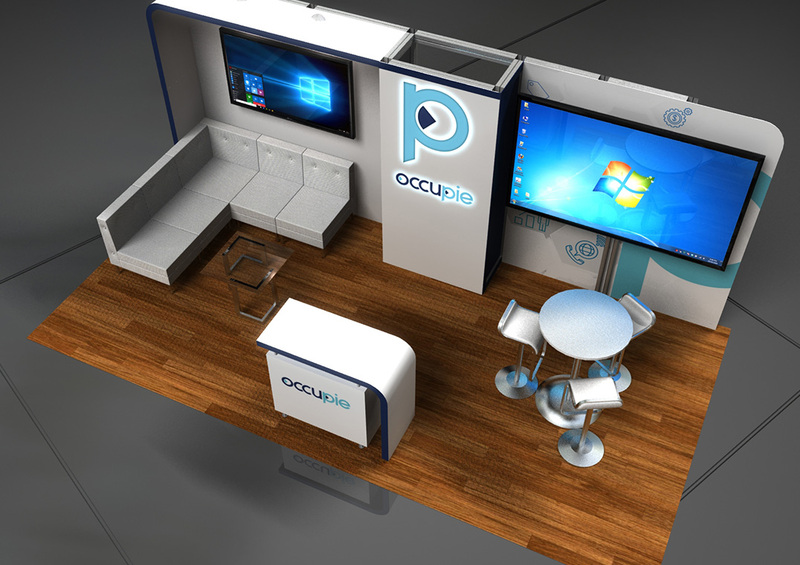 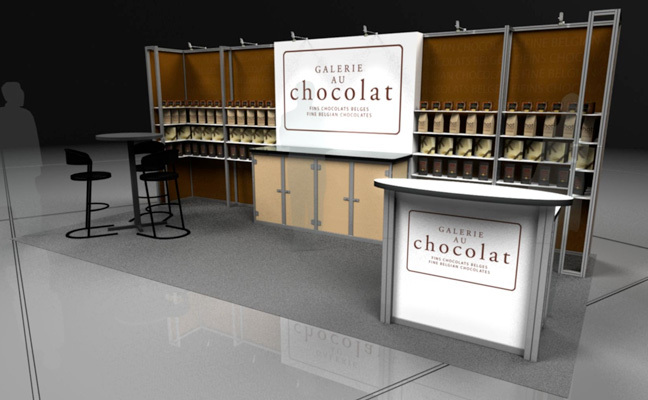 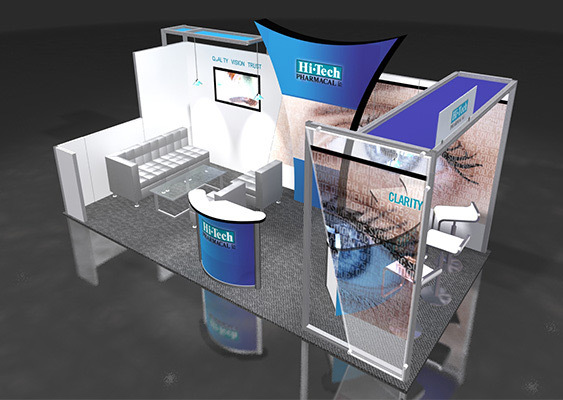 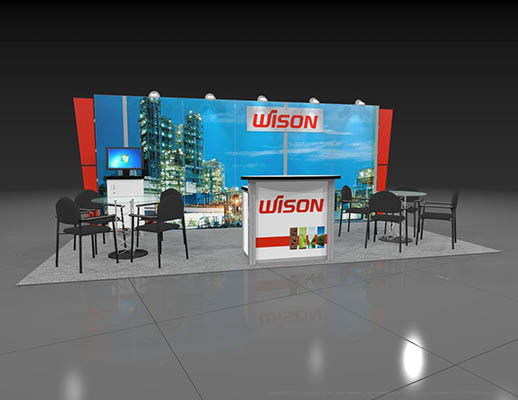 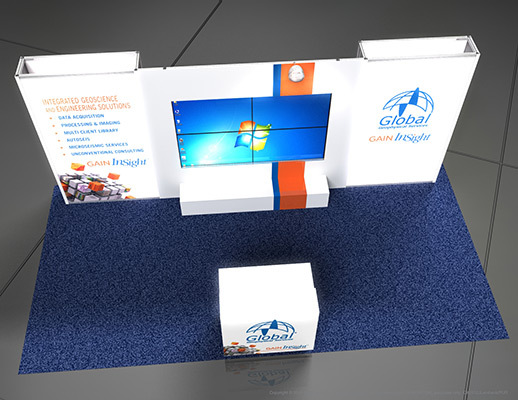 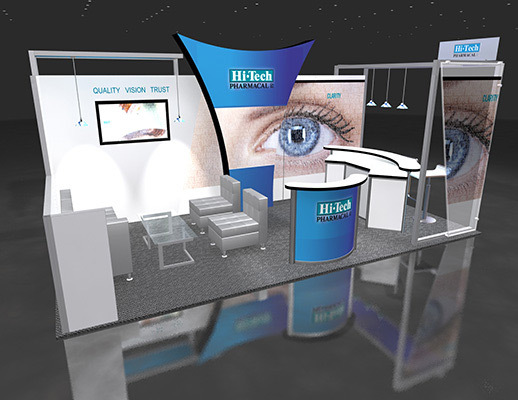 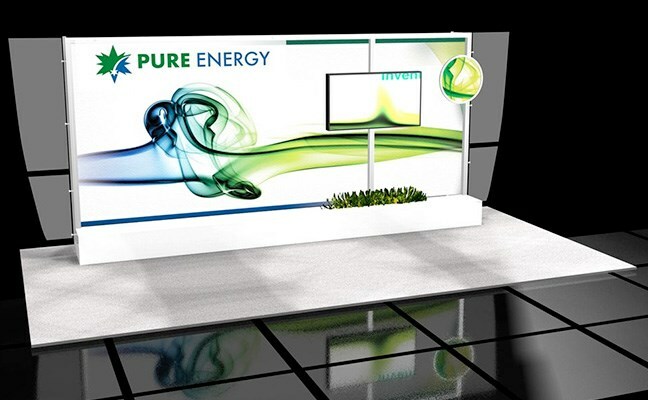 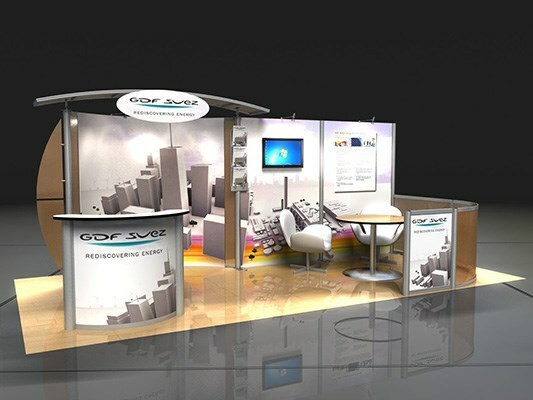 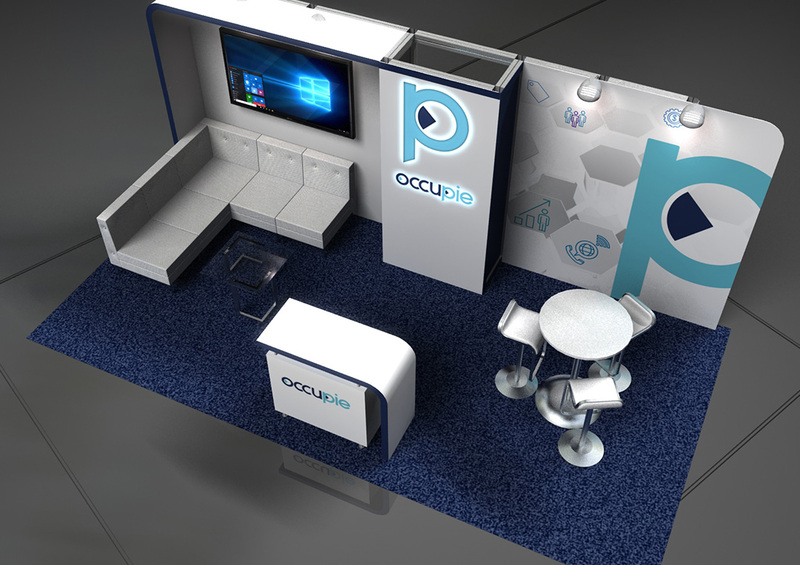 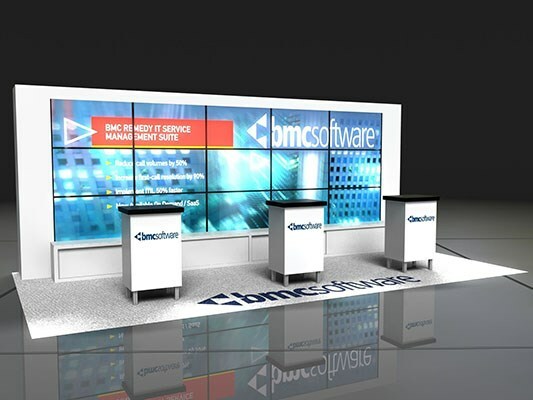 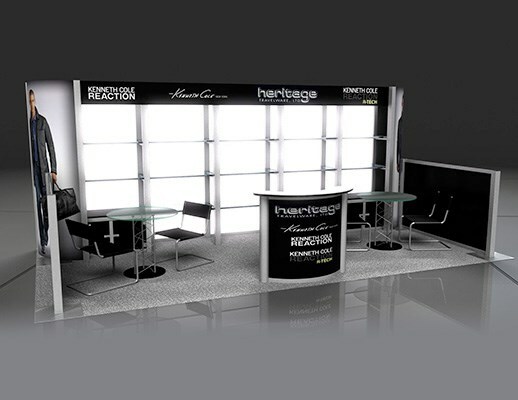 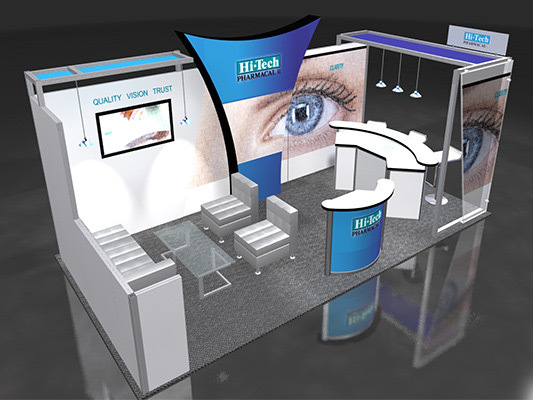 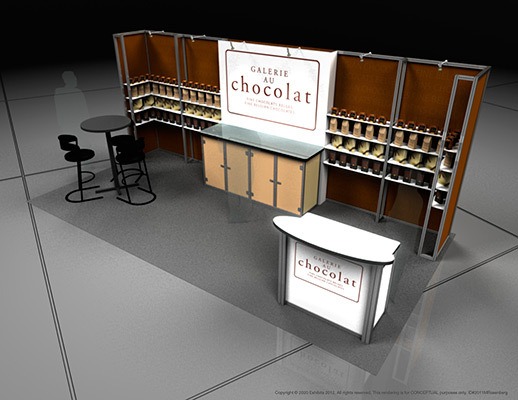 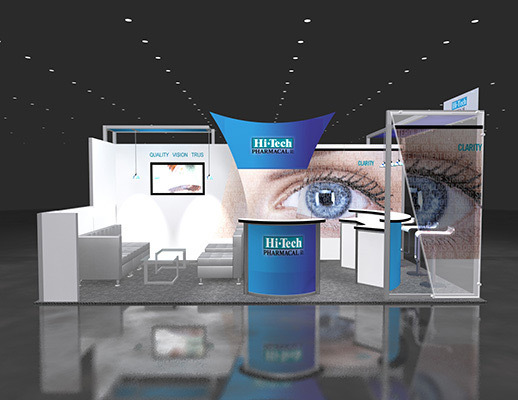 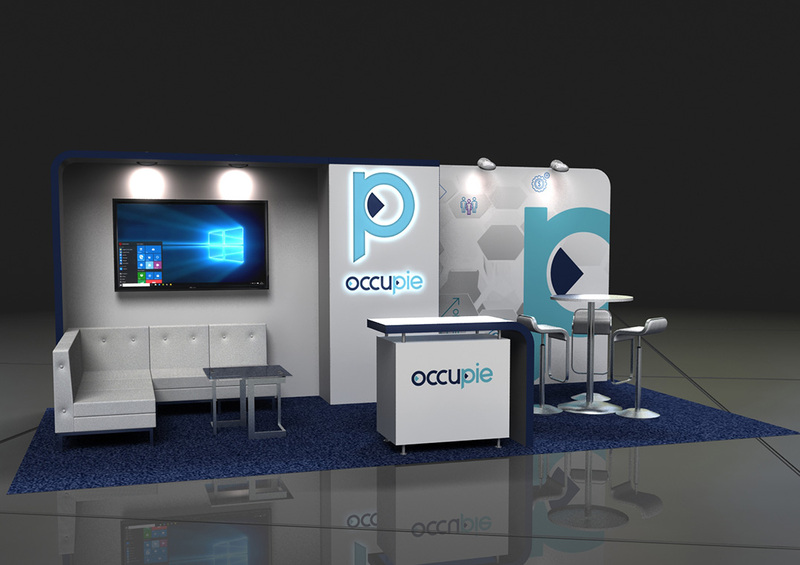 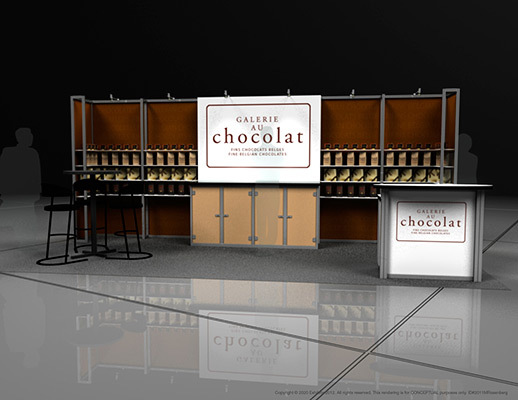 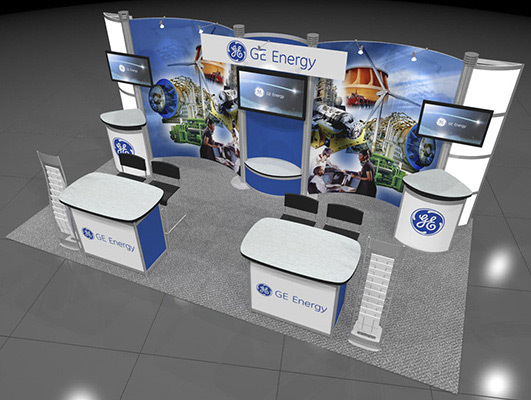 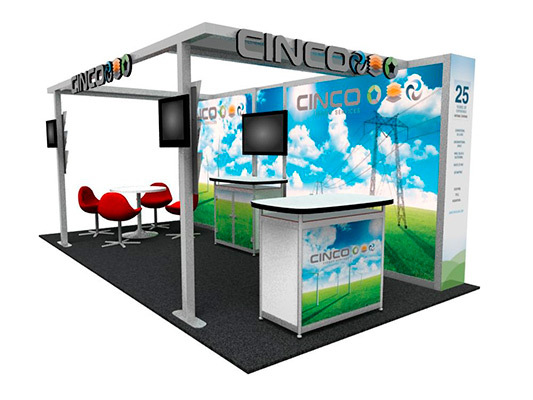 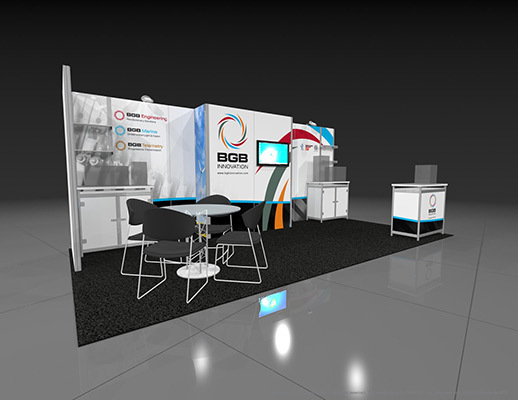 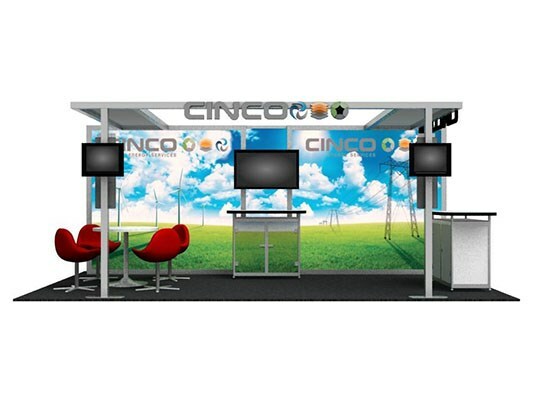 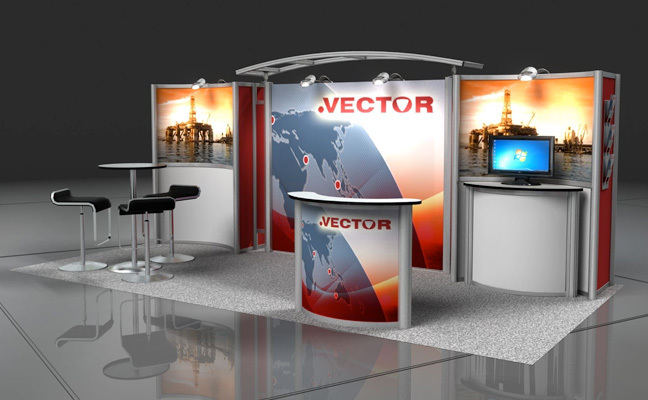 Features include: double graphic backdrops, overhead curved graphic logo signage, multiple video monitors, multiple video stations, carpeted inlay, information kiosks, strong branding, overhead lighting, dual reception desks, literature displays, storage cabinets and storage areas.